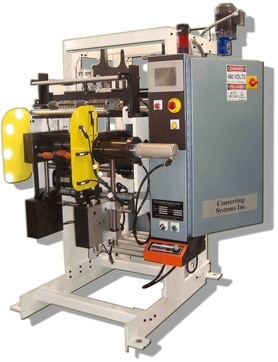 Downstream Plastics Converting Equipment Options (Controls, Add-ons & Upgrades) - Converting Systems Inc. Converting System's offers several options to expand and increase the productivity and safety of your current machines. CSI is now offering a cheap alternative to paying for an expensive service call. With our new remote web camera, it's like having a CSI technician right there in front of the issue, giving us the ability to provide real-time diagnostics and troubleshooting for any CSI machine on your premises. Immediate response to on-site problems: CSI technician has a 360-degree real time view of all operational parts in motion and can remotely operate the machine through the HMI. Easy to use: Retrieve camera from machine cabinet, using an ethernet cable, plug the camera into the same switch as the HMI, PLC, and M-Guard. (Note: Camera requires a CSI programmed M-Guard. Available for purchase if needed.) (See electrical drawings for a detailed diagram). Universal: Camera uses a standard IP address so that it can be used interchangeably on any CSI Winder, Bag Machine or Separator. Saves time: Reduces the disruptive back and forth of personnel during the troubleshooting process. CSI’s Pneumatic Clutch Retrofit is made for GEC winders with manual clutching systems. This new system allows older winders to simulate the roll transfer cycle of more advanced winders where spindles start and stop automatically, making them safer to operate. 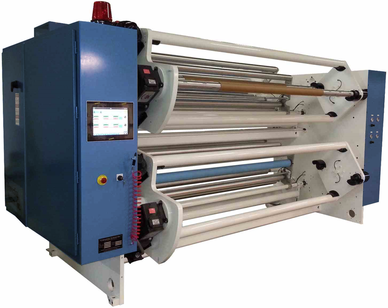 Roll transfers can be introduced with spindles engaged in a “low torque” mode, allowing for much safer film transfers. The incoming spindles can actually be stopped by hand, eliminating the potential for wrapping up clothing, gloves, hair, etc. while making a film transfer onto the new spindle. This system can be retrofitted onto most mechanical clutch style winders. Converting Systems has provided world class systems retrofits for many different winding systems, including Gloucester models 123, 124, 135, 192, 1001, and Sano DTW and STW. Developed specifically to help keep operators out of the machines, this retrofit is extremely useful in transferring larger lay-flats in a much safer manner. Operators apply a small amount of tape to the core and begin the cycle. The rest is completely automatic. ​Ask about our Bag-On-Roll transfer option used with the Flying Plunge Cutover System. These Clamshell style guards have been designed for use on new Converting Systems bag machines or various other manufacturers’ shuttle style machines. When an operator flips back the Lexan guard to access the machine, the guard system signals the bag machine to stop production. This then puts the machine in a "safe" mode for the operators to perform set-up, maintenance, or web up the machine. With the ability to mount on many different suppliers machines, these guard systems are an economical way to meet stringent safety requirements. This retrofit system is designed for typical hydraulic style inline bag machines to eliminate the original bag length "variator" unit supplied on many inline bag machines. Operators now have the ability to quickly and accurately set up these machines for production and change the bag length the very next cycle after data entry. This new system is a great way to improve your existing hydraulic machines on a very reasonable budget. Included in this controller is a 12-position hole punch controller, along with an alarm output for bag count. As an option, an electronic registration system is available for registered print applications. Can be installed in-house using your personnel. Bag lengths: 10 - 100"
Dwell time: Up to 3 sec. This hot knife Slit Seal Unit utilizes small, heated blades to penetrate and seal plastic film as it is passed over the blade. It operates with a 125VAC 50/60Hz power and includes a 6' power cord. CSI’s Pinch Roll Edge Guide System is designed as a “drop in” system to help guide a web through a bag or pouch machine. 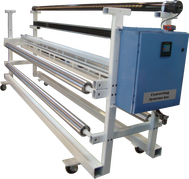 Since it does not require the web to be "wrapped" over or under any rollers, it is ideal for film which have fixtures installed that cannot be wrapped over/under any camber rollers. This system uses a laser sensor to accurately monitor the edge of the web. The control unit then makes adjustments to pinch rollers to pull the film in one direction or another. Incredibly easy installation and set-up make this unit an ideal field retrofit on any number of different machines. The solid model (see picture) provides a visual of an installation in the sync. Section of a typical side weld and bottom seal machine - note the section rails used in the model. These retrofits provide top of the line systems with all the industry standard "bells and whistles" at a fraction of OEM cost. Our systems utilize Allen Bradley based components including Contrologix, PLC-5, or SLC 500 plus easy to use touchscreen. These systems are designed to be retrofits for existing lines, for customers adding additional extruders, and for those looking to modernize their equipment with the latest in PLC to Drive systems communications. Allen Bradley's DeviceNet protocol has been successfully implemented in this package to provide communications between the host PLC and, in most cases, an AC or DC Line Drive system. A large number of drive manufacturers now provide Devicenet capable systems. Drive systems currently in use include ABB AC Drives and the Eurotherm LINK2 system with others available upon request. Single and multi-layer systems are available. CSI offers a cost-effective way to upgrade older panels. 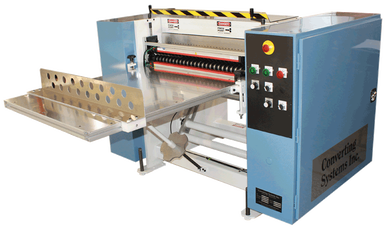 Available in single or multi-layer, CSI Extrusion Line Panels utilize discrete temperature controllers, digital displays, push/pull buttons, and potentiometers. All drives used are AC vector type with vector duty motors. As with our PLC extrusion control packages, we can also integrate existing extruder line drive systems if required. With prices starting at around $ 22,000, this is an attractive way to eliminate those obsolete panels. CSI has redesigned our Separator Table Extension, making it easier for operators to set-up and adjust as needed. New streamlined extension slides out to provide an additional 26” of work surface to accommodate larger bag sizes (70” maximum with extension). Available in 50”-100” widths (larger sizes available). New “1-click” magnet design allows the fence to be re-positioned quickly and easily without extra hardware or jamming. New tool-less knobs lock extension in place – no more tools required or lost screws. Perfect for GEC machines and separator rebuilds. This improved tool-less design supports our goal to provide more operator friendly machines to our customers. CSI’s Variator Replacement System allows customers the ability to upgrade only the Tension Variator portion of a shuttle style machine. On many older machines, a worn-out shuttle tension variator becomes inconsistent, allowing film tension to vary greatly during a production run. Inaccurate set-up, and inconsistent tension control cause a large amount of scrap. CSI’s Variator Replacement System transforms the variator system to an electronic line shaft controlled, servo axis. This servo follows EXACTLY the encoder feedback from the machine, then follows EXACTLY the speed of the nip rolls. 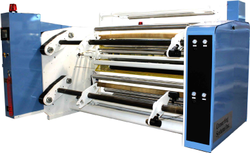 Whether running 25 FPM or 250 FPM, the servo will follow accurately and deliver consistent film tension. Operators can easily adjust shuttle tension through a data entry keypad unit with a "+ or –" adjustment within a pre-determined limit. CSI’s Hole Punch Control system offers production personal a simple and intuitive solution to increase reliability and precision of the hole-punching application. 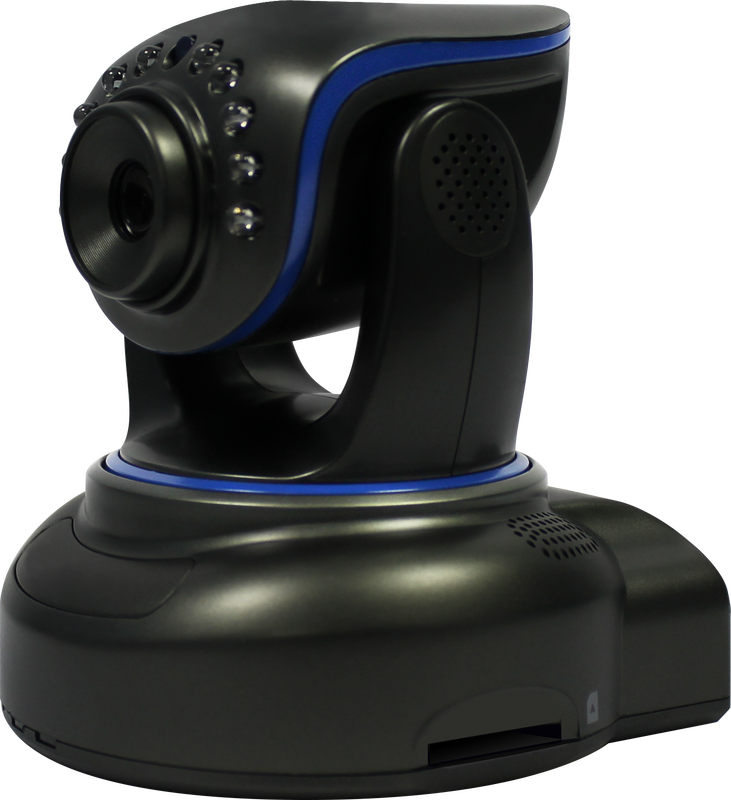 It measures using a high resolution encoder which provides both the line speed and distance input. Operators are provided with several easy to navigate screens, allowing them to set up the number of holes, distance to the holes from the seal, the dwell time of the punch output, and it has the capability of running continuous holes with no need for a seal input. Included with this system is a screen which displays the encoder's feedback, allowing personnel to diagnose possible system problems. The simplicity of this package allows for in-house installation with your own personnel. 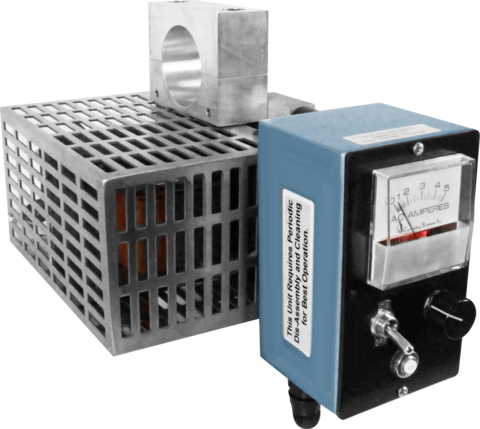 This Control System can be used with any blown film auxiliary equipment and virtually any existing punch bank. Upgrade your older winders with the same advantages as newer winders. CSI now offers a low-cost upgrade solution to end compromised roll quality due to the inability to lower winding tension as the roll builds. For many years, we have been designing and providing taper tension systems to customers throughout the industry and we’re confident our systems will work in your facility. This is available for customer installation on rewinds OR unwinds, these systems are very dependable. CSI offers two different styles of web oscillators. Each style oscillator is driven by a small stepper motor which allows for higher torque capacity and variable speed. Oscillators are easily configured to follow a variable line speed reference. 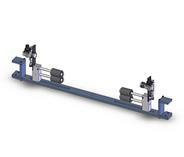 These units have proven very versatile in a number of oscillating spindle rewinders with the flexibility to mount different types of feed heads, dependent on application.